The Second Annual Gathering & Auction is just a few weeks away! This year, we have added a small silent auction to the mix. Check out our fantastic selection of items and packages below. Thank you to all our donors and supporters who made this possible! The Deschutes River Alliance’s important Clean Water Act lawsuit against Portland General Electric is headed back to court. 2018 will be a critical year in our fight to protect and restore the lower Deschutes River. We are moving aggressively ahead. On February 26, the DRA’s attorneys will be filing a Motion for Summary Judgment, asking the court to find PGE in violation of its Clean Water Act certification for the Pelton Round Butte complex. The DRA has identified nearly 1,700 violations of the certification, which was designed to protect the water quality and ecological health of the lower Deschutes River. Oral arguments on this motion are scheduled for July. If successful, the DRA will then ask the court for a remedy to these frequent violations that will lead to improved water quality in the lower river. The hard work starts now. 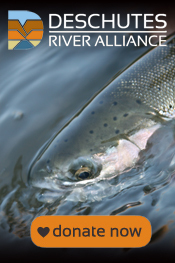 The lawsuit we are engaged in is an essential component of the DRA’s advocacy efforts on behalf of the lower Deschutes River and the fish, wildlife, and people who call it home. And the next steps in this litigation, over the coming months, will be critical to the DRA’s efforts to restore cool, clean water below the Pelton Round Butte Project. Keep an eye on the blog for more updates on this important case. As always, this fight wouldn’t be possible without the support of our many hundreds of contributors—the individuals, businesses, foundations, and allied organizations who are not ready to give up on a healthy future for the lower Deschutes River. As we pivot back to court, we need your support more than ever. Please join us at our second annual benefit auction in February, and make a contribution today to support our battle for the Deschutes River.